4.5 million Americans receive blood each year. 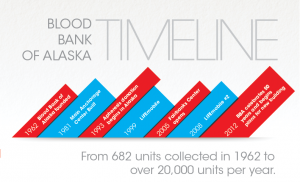 In Alaska the Blood Bank of Alaska has our backs covered when and if we need blood or blood products. However, blood banks depend on the public to help meet the demand. We discuss the Blood Bank of Alaska with Robert Scanlon, CEO and Ryan York, Chairman of the Board of Directors on this edition of Line One, Your Health Connection.